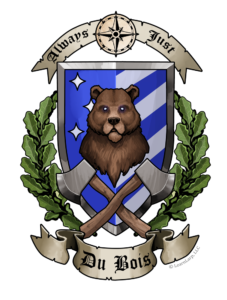 The crest of Maison Du Bois features the noble North American Grizzly Bear, a formidable hunter and master of survival. Much like the Du Bois house founder, Étienne Brulé (Ay-tee-en Broo-lay), grizzlies control wide territories and are often found in coastal systems. The royal blue symbolizes this element of water, as Brulé was a trapper and explorer along the Great Lakes region, and traveled the intercoastal waterways throughout eastern and midwestern North America. The stars symbolize navigation, of knowing one’s place in the universe, having a sense of purpose or direction. The compass evokes this as well, although it also points to a powerful magical artifact that belonged to Brulé, who charmed (or hexed, depending on your point of view) an ordinary compass to detect the heartbeats of any living creature. Brulé alone possessed the considerable knowledge to distinguish the species of each heartbeat detected, which he used both to become an infamous tracker and trapper, as well as to escape the long arms of the French-Canadian authorities who would attempt to regulate and outlaw Brulé and his compatriots, known as coureurs de bois. They considered themselves entrepreneurial and independent; the authorities thought they were undercutting their economy and avoiding their tariffs. A superior partnership with the native tribes meant Brulé and his partners operated outside the reach of the colonial rule, just they way they liked it. The grizzly symbolizes Brulé himself, who worked closely with the Huron Bear Tribe before they allegedly tortured and devoured him on suspicion of betrayal. Escaping by canoe down the Susquehanna river and to the Chesapeake Bay (where he met up with another house founder), Brulé let this story of his death stand, so that he could continue to operate more covertly. News of his supposed demise also had the beneficial effect of throwing off his many enemies. Members of Maison Du Bois, like their founder, have a tendency to never back down and what appears to be an honorable fight can turn into escalated retaliation that backfires. The oak branches refer to the steadfastness and strength that members of Maison Du Bois value. The grand oak trees start from a single seed and grow to provide shade and protection in the forest. Members of Maison Du Bois, who are often drawn to the Path of the Marshall, see themselves as providing this sort of shelter from harm through their commitment to maintaining law and order in the provinces. The crossed axes refer to the mastery over the elements, a pruning and taming of the wilderness to forge a new world and to provide personal gain in the form of commerce and use of natural resources. They also refer to the cutting down of tyranny, treachery, and lawbreaking; members of Maison Du Bois identify with slicing through injustice, and attacking evildoing wherever it may be found. They themselves may have a certain disregard for the rules, but this is obviously a matter of interpretation. The original house motto was Persevere and Excel, two qualities Brulé valued, and cultivated in his students through rigorous physical training, including wilderness quests and survival tests. After the Magma War of 1825-1830, the house motto shifted to its present-day one, Semper Aequus or Always Just. The most highly trained and sought-after Marshalls now come from New World Magischola, and nearly all from house Du Bois. While Brulé once outran the government’s edicts, today members of Maison Du Bois, and the Magimundi Marshalls, seek to uphold them.